It’s all right there, within easy walking distance, making every aspect of your life that little bit easier and more enticing. The buzzing café and restaurant culture of Northbridge is strolling distance away, as is Yagan Square, RAC Arena Perth and your office in the city. Heading further afield, trains, buses and bike paths are just metres from your front door. To the north lies Miligan Steps, a vibrant pedestrian-only ‘Spanish steps’ style plaza that will play host to a hub of restaurants, cafes and bars – just another part of this exciting precinct that will offer residents and visitors a unique urban lifestyle experience to rival the world’s most iconic cities. Set on the water’s edge of the Swan River, Optus Stadium is ranked amongst the world’s best and boasts the widest range of seating and hospitality options of any stadium in Australia. Easily accessible by train or on foot via the Swan River Pedestrian Bridge, you can soak up the spine-tingling atmosphere of a 60,000-strong crowd, any time. 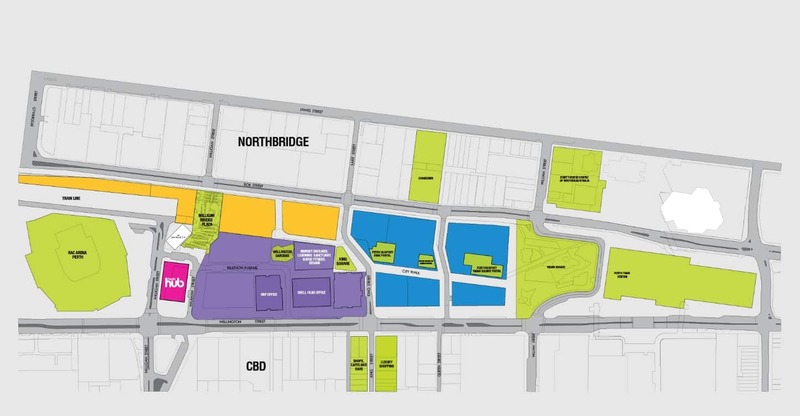 Northbridge Precinct (400m) - The vibrant Northbridge area is home to some of Perth’s best dining and nightlife venues and is only a short walk away from your front door. King Street Dining Precinct (500m) - The newly developed King Street precinct is home to luxury boutiques, dining experiences and bars. CBD (500m) and Elizabeth Quay Dining Districts (1.5km) - Home to some of Perth’s finest dining including Wildflower, C Restaurant in the Sky and The Stables.